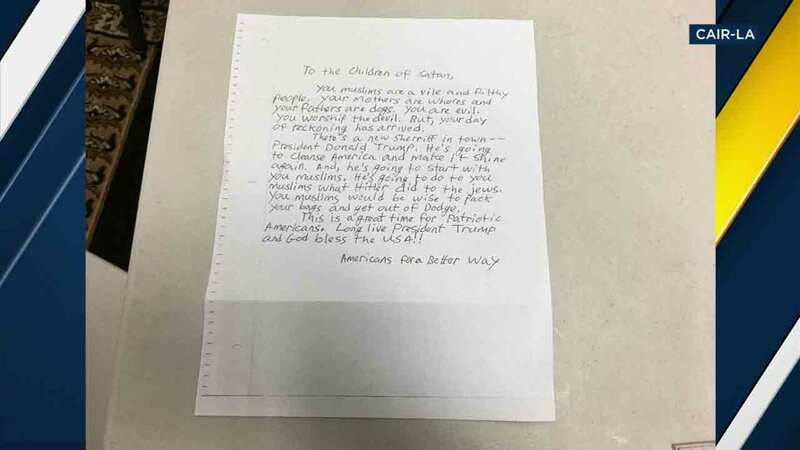 A hate letter addressed to "Children of Satan," which was sent to three California mosques, including two in Long Beach and Claremont. LOS ANGELES -- The Greater Los Angeles Area chapter of the Council on American-Islamic Relations Saturday was calling for extra police protection at local mosques following a disturbing hate letter that was received. According to a CAIR-LA press release, the letter was sent to the Islamic Center of Long Beach and the Islamic Center of Claremont. The letter was addressed to the "Children of Satan." The writer called Muslims a "vile and filthy people" and called on them to "pack your bags and get out of dodge." It added that President-elect Donald Trump is "going to cleanse America and make it shine again," by doing "what Hitler did to the Jews." CAIR's San Francisco Bay Area chapter called for similar police protection of mosques after the same letter was sent to an Islamic center in San Jose.